Every autumn I look forward to some freshly made apple cider doughnuts in addition to visiting my local apple orchard. This year I thought it would be fun to make my own from scratch so I could be in control of how they were made. I wanted a baked doughnut rather than a fried one to cut down on calories and fat. This recipe is super easy to make and it takes very little time. You just need a doughnut pan (which was harder to find than I thought it would be!). Everyone must be at home making doughnuts since I could only find one pan in all the stores we checked. 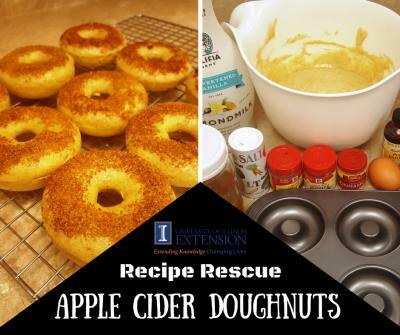 This recipe is "healthier" because it's baked not fried and contains more whole grains and less sugar and fat than your typical store-bought apple cider doughnut. Instead of tossing the entire doughnut in cinnamon-sugar, you are just covering the tops. See below for the Nutrition Facts Face-Off. Preheat oven to 350°F and grease a doughnut pan with butter, then lightly dust with flour. In a large mixing bowl, mix together the flour, sugar, spices, baking powder and salt. In the same bowl, mix in the milk, cider, vanilla extract, eggs and melted butter. Mix well. Fill doughnut pan 3/4 of the way full. Bake for 8-10 minutes or until they spring back. Remove from oven and let sit 2 minutes before removing from pan. Lightly brush tops with melted butter then dip in the cinnamon-sugar mixture. This recipe will make 13 regular-sized doughnuts. 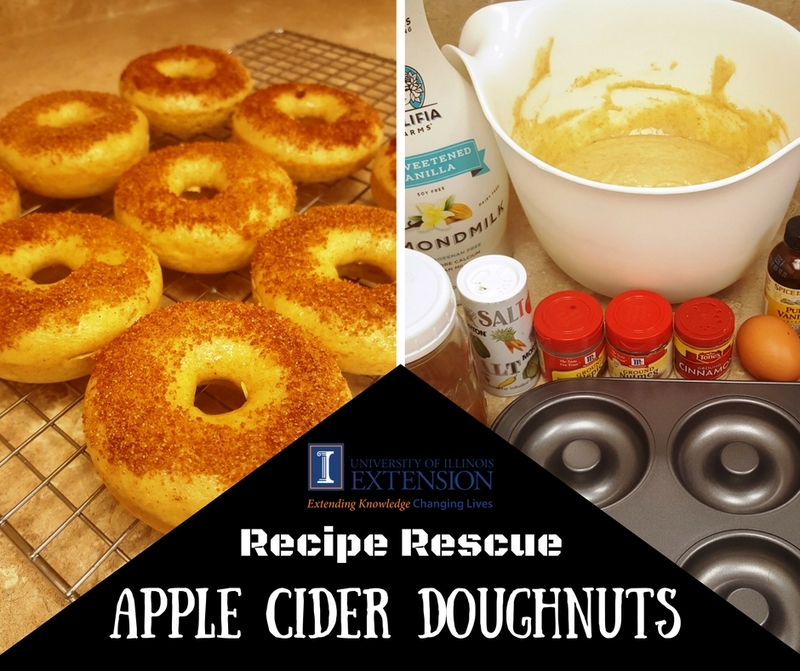 The doughnuts are best enjoyed with a glass of apple cider on a warm autumn afternoon or with a steaming mug of coffee while watching the sun rise on a chilly fall morning. *University of Illinois Extension does not endorse commercial products or companies even though reference may be made to trade names, trademarks or service names.